An illegitimate girl of primary-school age in Zhuhai , South China, was turned away by the local schools, because her mother is not able to afford the hefty fine for illegitimacy, according to sohu blogger Han Tao’s report . "I am a local child. I want to receive compulsory education, too! " 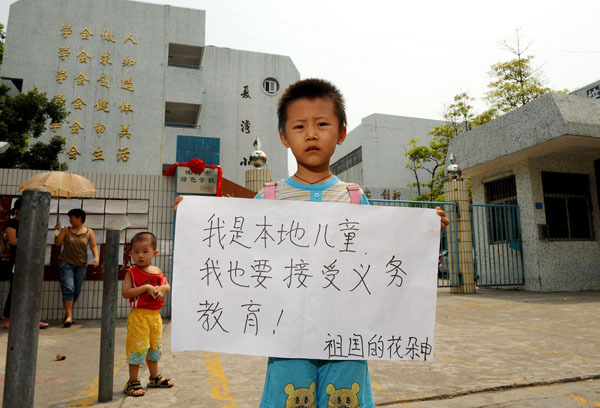 Xiao Qing carrying a placard stands at the gate of Gongbei Xiawan Primary School and she is so anxious to go to school like other little boys and girls. 7 years ago, her parents gave birth to her without registering for marriage. Then her father walked out on the family. Since Xiao Qing was born out of wedlock, the mother has to pay a 9000 yuan (about 1321 US dollars) fine to the family planning department so as to apply hukou (a kind of residency permit in China)in Zhuhai for her daughter. However, the single mother cannot afford it, even though Xiao Qing has reached school age. Desperately, the mother could only take her daughter to the relevant departments to ask for help. During two months, they visited the family planning department, the education department, the sub-district office and the local government, but none progress was made. As the new term was coming up and the children of the same age nearby all went to school with new bags, Xiao Qing and her mother were deeply depressed. Failing to intercede with the authorities, the mother came up with her last idea that she wrote down on a piece of paper “I am a local child. 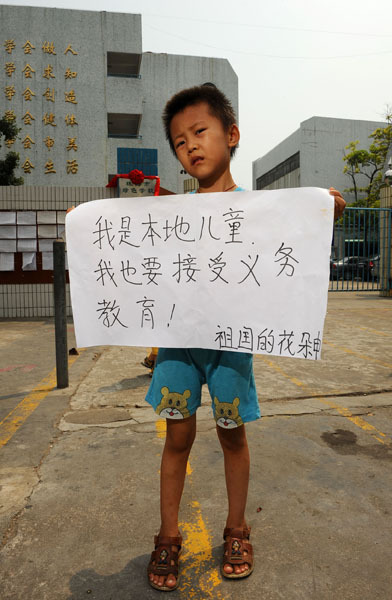 I want to receive compulsory education, too”, and let Xiao Qing stand at the school gate with the slogan, hoping such extreme measure would attract the attention of the news media and relevant departments. "The mistake I made has nothing to do with my child. She is a human being. Why can’t she apply hukou? Why can’t she receive education?” Xiao Qing's mother said to me. Hope the net friends who have read this post may reprint the article and pictures and put them on more websites. I appreciate your concern for Xiao Qing. Our journalists are trying their best to mediate the problems. I will immediately update the post as soon as there is any new information. If you need to contact with Xiao Qing, please call me. My cell phone number is 15819497255. Family planning is a basic state policy of China and illegitimate birth violates it. If we change it only for one specific case, the policy will never be implemented. And consequently, people will face more pressure of life amid population explosion. We must look at this problem from an overall point of view, but not a particular one! Illegitimate children are also human beings, having the basic human rights, especially the right to education. If without the rights, does that mean the girl was born to be surplus? Can we deprive of her basic human rights at will, even including the right to subsistence? Obviously not. But why was her education right taken away? What a social system! What a human-centered development! What a country under the rule of law! Indignation!! If you guarantee the girl’s rights today, who will guarantee other children’s rights tomorrow, including your child? When the population of China soars, there will be more innocent people lose their social rights!! Although the child didn’t make any mistake, can the mother cover up her fault for the past years? Why didn’t the mother scare up money to pay the fine? Why did she let her innocent kid bear all the things? She just took advantage of the public controversy to solve her own problems. And have she ever thought if her arrangements will bring her child psychological problems? 9000 yuan (about 1318 US dollars) is not as much as ninety thousand yuan (about 13189 US dollars). It won’t be difficult to raise so much money as long as she desperately works, right? Is she qualified for a mother to use her child in this way? No one is willing to have a baby without marriage, especially to a mother. There must have been an unutterably predicament that forced her to do so. A single mother has to bear so many hardships and difficulties to raise her child, so what she needs is help. Moreover, Illegitimacy is not against the one-child policy . It’s so ruthless to make their life more miserable. Giving birth is every normal woman’s birthright. It’s originally wrong for the current system to repress it. However, the girl has come into this world, under the social system of China, so she is certainly a mistake in law. But I want to ask those who gave irresponsible words if human love is wrong. In this mammonism society, the nobility and gentry are allowed to have children as many as they want, because they are rich. So does that mean the law is something to restrict the poor and clean the road for the rich? What a woe! If the law varies from person to person, it means there is no law! The children are innocent. The people are the center and roots of the country and the will of the people give the right direction. Any system should have the human rights first. The hukou system is wrong since the very beginning. Once the baby was born, he or she has the right to existence, which is one of the basic human rights. Will the person vanish because he is not issued with hukou? It will only make the people unfairly treated be hostile to the society. Consequently, the society may end up paying a heavier price. Can we expect a harmonious society in this way? Why can’t our government treat her people better and more tolerably? what kind of a backwards country charges a mother, whose child’s father, has walked out on them a fee for having the baby? first of all, she should be commended for not having the child aborted despite the ridiculous fine in place for having a child out of wedlock. china should be ashamed of themselves as a nation that they would encourage forced abortions and sterilizations on people who just want to do the right thing. secondly, what kind of a sick government denies education to an innocent child? this poor little girl cannot help the fact that her mother and father were not married when she was born, much less that her hit-and-run father took off and left her and the mother alone. unbelievable. if anyone should have to pay the fine it’s the dirtbag father. I agree 100% with Matt, the fine should be paid by the father. Is there a law in China that forces deadbeat father to pay child support? He is the one that should be punished. An unjust law indeed. Who defines what is right and what is not? dont use your moral standard to judge us. of course you dont understand the population situation is china because you didnt grow up here and ever experienced the intensity of the sharing of public resources. you would never understand how it feels like to share a school dorm with 10 – 16 people for 8 years and the only private space you have is a twin-size bed full of all your belongs(desktop computer, clothes, candies, books…and yourself) . i dont want to give a a whole lesson here on how bad the population problem in china is. but the faimly planning policy is the only short term solution to it, and just like some of the translated comments above saying, the law is the law, if it gives exemption to specific cases, it is no longer called the law. I agree that it is neither the mother’s fault nor the kid’s fault. but it doesnt exempt her from any punishment for the fact that she violated the policy. As a taxpayer, I wouldnt want to pay for other people’s mistakes just because they made the bad choice for their life, such as teen pregnancy. in this case, i rather to donate money to her at my will, than being taken away tax money to help her without asking for my permission. beside, who says abortion is against any moral standards? god??? if you believe in such thing. but who are you to judge us based on your god theory. if anything, shouldnt we believe in buda rather than the imported god? dont you know that your god standard might not apply to other cultures? Its absolutely wrong when China is one of the leading exporting nations of babies to the American Adoption Industry. You don’t have to believe in Buddah or God to know that this is wrong, the discrimination being done to women and children and families in your country is disgusting. you’re right, dpchinese. i don’t know what it’s like to live in a crowded, filthy country who undercuts every other nation in labor b/c of the horrible wages and conditions that their workers slave under. i don’t know what it’s like to live in a godless society where the only way to decide what’s right and wrong is based on how you feel, or what your government tells you is right and wrong. but whether or not you believe in our God or not, you can’t tell me that your conscious would rest easy thinking that it would be better to force a mother to murder an innocent child with a heartbeat because her man left her and she can’t afford to pay a fine for the mistake that the both of them made. WHY DOESN’T YOUR COUNTRY CHARGE THE MAN WHO LEFT THE FINE, INSTEAD OF DUMPING IT ON THE MORE RESPONSIBLE OF THE TWO? please, in all your zen-like wisdom, answer me that. you are absolutely right. the gender discrimination from the old chinese tradition is completely wrong. especially as a modern female, it disgusts me a lot. my family adopted a baby girl from her parents who wanted to give her away, just to have another chance to have a boy. who knows how many more girls they are giving away before they can finally have a boy. it is sad and disgusting. at least we, the educated young generation know it is wrong. we are never ashamed to admit that there are bad parts in our culture. the question is what we can do to about it. education is the long term solution to this phenomenon. laws and related regulations should be made to prevent it from happening and punish those parents. however, i dont really understand why you raised this point here. is it anything to do with this article or my comments about abortion? Matt: I cited a sentence from your comment and argued over this particular topic about forced abortion and sterilization just to make the point that forced abortion and sterilization is not wrong if failing to control the population could potentially lead to certain social problems. As I mentioned before, the mother should first seek help from society, such as receiving donations, rather than expecting the government to change its laws to suit a specific case like hers. You mention that the father should pay the fine. Well, yes, her mother could totally take legal action to get the father to share the fine, provided that he is not dead or she could still find him. It is not like the government wouldn’t allow her to do so. “Murdering an innocent life” at conception or raising a child in squalor, which one sounds more cruel? If you are not ready for a kid, financially, emotionally, and mentally, please do not give birth to a child. It is unfair to the child and can potentially become a burden to society. I am sure you must be so happy not having to deal with chinese social problems, just like I don’t have to deal with yours. BTW, if we could compete in the global economy with the advantages of surplus labor-force and low currency exchange, what’s wrong with that? Isn’t that what Capitalism and globalization are all about? And just in case you don’t know, making US$100 a month in China with accommodation provided by the factory isn’t as bad as you imagine, based on your country’s living cost. Beijing buses cost 5.8 cents, and 40 cents US could buy lunch. Oh, about the working conditions and the filthy environment, isn’t a significant part of that due to foreign investors who want to keep their home country clean while exploiting cheap labour in china? If you believe the chinese people believe in whatever the government tells you is right or wrong, well, I have to say that statement is pretty ignorant. BTW, I dont even believe in Buddha. You try to paint China as a “godless” society where morality is set by the CCP, and think Chinese people crave Christian morals to correct the current moral code. China has been around for a while and for thousands of years we were not a “godless” people – we had our own gods, and our moral code was set based on these native religions and philosophies. So even before we became an atheist country, our religious and social morals were not the same as those in the Judeo-Christian world. The point is not who’s right or wrong over abortion, or child support. The main point here is that, regardless of the law, the CHILD shouldn’t be punished for the errors of either parent. I won’t argue anything else…that child deserves a better life, even if her parents don’t.